The Cypriot community of Australia including the Justice for Cyprus Coordination Committee SA (SEKA), in association with the Cyprus Community of SA, is organizing a series of memorial events to commemorate the 43rd anniversary of the Turkish invasion of Cyprus. “These events are an expression of our solidarity and support to the people of Cyprus, wherever they may be, and a mark of respect to those who lost their lives for liberty,” says Professor Andreas Evdokiou, President of the Cyprus Community of SA, told neoskosmos.com. The events will begin on Sunday July 16 at 10:00 am with a memorial service at the Church of St George in Thebarton followed by a wreath-laying ceremony and doxology at the Memorial of the Unknown Soldier which will pay tribute to those who lost their loves and went missing — never to be found — during the 1974 Turkish invasion of Cyprus. “We will also have an open forum discussion on the current position of the Cyprus issue by this year’s official representative of the Republic of Cyprus, Michael Sofokleous director of the President’s office,” Evdokiou told neoskosmos.com. The presentation will be at the Cyprus Community of SA club rooms in Welland on Wednesday July 19 at 7:00 pm. 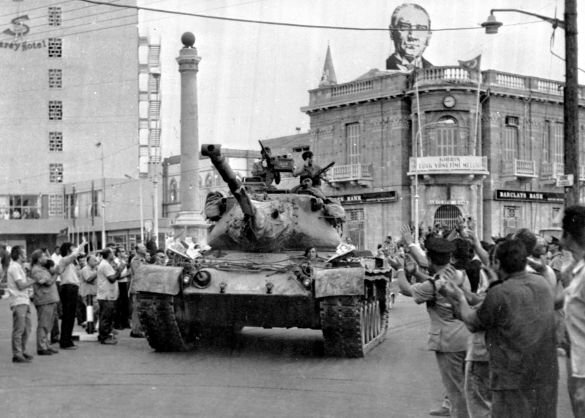 The Cyprus Conflict, as it is known today, began to take form on July 15, 1974, when the Greek military junta known in Greece as “The Junta,” attempted a coup by Greek Army officers in Cyprus to achieve the reunification of Cyprus with Greece. A mere five days after the coup attempt, Turkey sent in troops in fear that a unified Greece and Cyprus would threaten the Turkish-Cypriot community. The result was a partitioning off of the island, with the Turkish Military occupying the northern third. The division of Cyprus extends from Morphou in the west, through Nicosia to Famagusta and has a buffer zone that UN peacekeepers have been looking after ever since the invasion, 43 years ago. By 1974 the Turkish invasion of Cyprus had resulted in the loss of 3,000 lives and thousands injured. Until this day there is still unconfirmed accounts of how many people went missing. Although there is still hope that a resolution to the Cyprus Conflict can be found, the talks remain at a crucial point and have yet to accomplish a peaceful agreement between the Turkish-Cypriots and Greek-Cypriots.